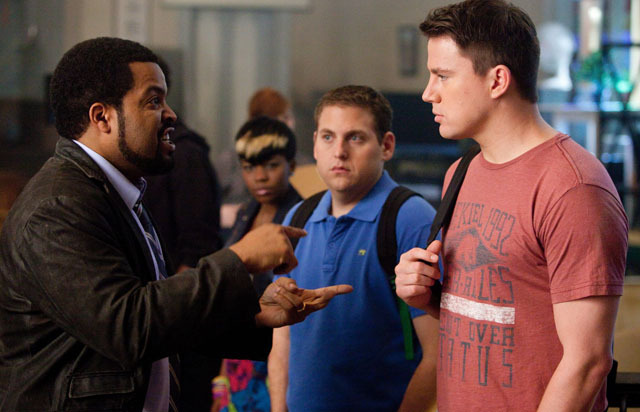 CHICAGO – Combining comedy and action is always a delicate balance, and Jonah Hill and Channing Tatum do it right in the upcoming movie remake of “21 Jump Street.” Goofing on the concept of two police officers undercover in high school, the story has fun with its two back-to-school characters. “21 Jump Street” first aired as a TV show in 1987, and is notable both as a starring vehicle for a young Johnny Depp and as the first regular series (premiering Sunday night) on the fledgling FOX network. The movie remake is loosely based on the show, with new police recruits Tatum and Hill posing as high school students to infiltrate a drug ring. The film also features Ice Cube, Rob Riggle, Ellie Kemper (”Bridesmaids”) and Chris Parnell. HollywoodChicago.com attended a press roundtable with Jonah Hill and Channing Tatum, and they were peppered with the following questions. Question: How did you both develop the chemistry that was necessary for your characters, to get the comedy and the action? Jonah Hill: Movies like this live or die on whether you believe these guys care about each other. All the great cop movies feel like the partners want the best for each other. Our friendship in the film was tested and put back together, and you kind of want them to make it through that test. That exists because Channing and I get along in real life, and we’re good actors. [laughs] I like to let it speak it itself. Question: Were you on the script since the beginning of the film concept, because you’re listed as co-writer? Hill: Yeah, I was the originator of this version of the film. Question: How many drafts did it go through before you came to the right balance? Hill: A lot of drafts. Channing Tatum: Even when I came on they were working through it. Hill: We didn’t stop working on it, up until the very end of the shoot. Question: Where did you both meet other for the first time? Tatum: I first saw him in a restaurant and we just waved to each other. Question: Why do you think you get along so well? Tatum: I really respect Jonah, I guess you have to respect somebody to get along with them. He’s one of the most creative and smart people I’ve been around, and he just cares. There are a lot of people who are driven only by success, and that isn’t Jonah. He is successful because he cares, and he cares about the people around just as much if not more. He is one of the cooler people I’ve met. Hill: I feel the exact same way about Channing. I think we both got along right away, it was just easy. The fact that he’s here, and he doesn’t have to do this type of movie, he did it because he wanted to make something different and something cool. There was no calculation in him taking the part. That’s me as well, I just want to do cool stuff and make interesting art, and have fun doing it. The publicity tour has been as fun as doing the movie. Question: Okay, new question. [laughs] In your upcoming films, like you in ‘Good Time Gang’ and ‘Neigborhood Watch’ and Channing in Steven Soderbergh’s ‘Magic Mike,’ will these films challenge the audience perception of your creativity as actors? Hill: I don’t know, I’ve had a lot of success in drama and comedy. I just want to keep making good stuff. I have something coming up with James Franco called ‘True Story,’ about the solving of a murder, and it’s has a ‘Marathon Man’ feel. It’s a really cool movie. ‘Neighborhood Watch’ is funny. For me, it’s about doing different things and not get bored, or make people bored by doing the same thing over and over. Tatum: Obviously the business likes to put people in boxes, like saying that’s who they are and that’s what they do. The first roles that I had might not have been me, but it was the first thing I had done, and people also get fixated on what they popularly know me to do. Not to get meta, but I have to challenge myself in doing different roles, and see into myself differently. I have to jump outside the box, otherwise it gets very complacent. That’s something that Jonah is doing, and that’s what I’m doing. I want to do something different every single time, I don’t want to be the same character or do the same movie. Question: There was a school shooting near Cleveland recently, that again focused on the various cliques in high school. Since your movie kind of goes into that, what’s your take on the different cliques that form during that time in our lives? Hill: First, what happened in association with that incident was despicable, awful, disturbing and sad, and has nothing to do with the type of film we were trying to create. I think people want to compare everything to everything, but there is no comparison in this case. Everyone – cool kids, geeks, jocks – have felt displaced in their life. It is the actions of a psychopath that goes and gets a weapon and uses it in a school. It is the action of a sick and disturbed person who chooses to do something like that. That’s my theory on it. Tatum: It’s strange, I’m sure there are outcast kids everywhere, but there wasn’t cliques in my high school. I grew up in the South, and there were definite race and cultural lines, but it didn’t have to do with forming cliques. I was a jock and I hung out with the smart kids, and also the kids that played ‘Dungeons and Dragons.’ There wasn’t people there making fun of other people. With more access to more information, with the internet and other resources, kids can get the idea to do this sort of thing. It’s just the times we live in. Question: You’re reliving high school in this film, what you both personally change if you could magically go back to your high school days? Tatum: I would be nervous to change anything, especially if it doesn’t turn out like it does now. [laughs] I probably listen more in high school. There were a couple of subjects I liked, history and science, the rest I just didn’t listen to. I know I have an aptitude for wanting to learn now than I did then. Hill: One thing we play upon in the film is that we got back, and what used to be cool is not cool anymore, and also what wasn’t cool is more accepted. We thought that disconnect was a funny avenue to play. What I would do if I went back I would do more theater in high school, because I was scared that my friends would make fun of me. Since I wanted to be an actor, I would have been more proud about what I wanted to do. That would have made it more fun and given me more experience with acting. You don’t appreciate it while it’s going on. Question: Jonah, in ‘Moneyball,’ you seemed to play your role like a wizard, very mysteriously. What choices did you make to get that vibe? Hill: That’s cool! I never really thought of that specifically. I couldn’t be more proud of that role.